I can’t tell you when the kitchen knife block was invented or who it was invented by, but it remains one of the best inventions for the kitchen since sliced bread. Prior to the knife block, the vast majority of Americans simply tossed their fine kitchen cutlery into a drawer, only to get dinged up and scratched. The knife block offers a solution that saves space and keeps your kitchen knives protected from wear and tear. While knife blocks have their flaws — they’re often impossible to clean, sometimes dull the knives, and often come in unnecessary sets — they are one of the most popular kitchen knife storage solutions around. 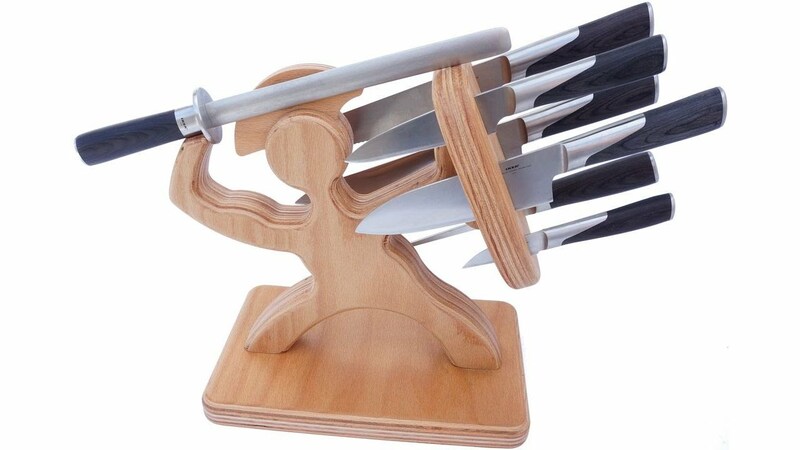 With all that said, the basic design of the knife block and its prevalence in kitchens across the world make the knife holder ripe for parody and creativity. That’s where these knife blocks come into the picture. These knife blocks prioritize artistry over function and they’re entirely impractical but they’re just so darn visually stimulating. This is the block that inspired me to write this post. Behold the pinnacle of insanity in all its glory. 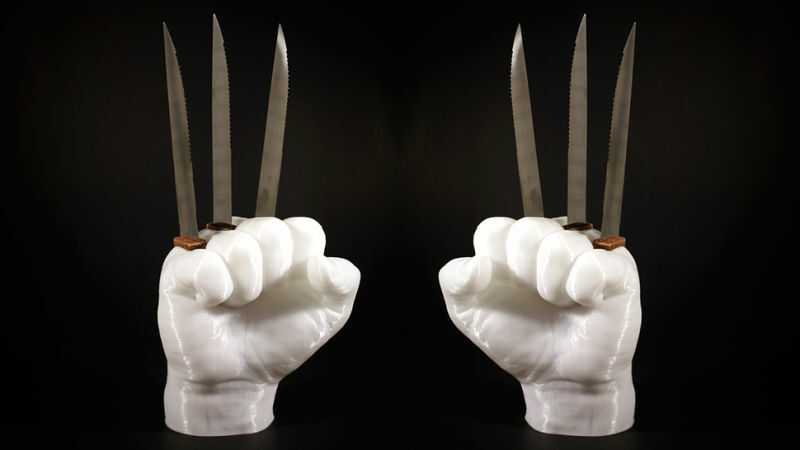 The Wolverine Steak Knife Holder is one of the coolest and most creative knife blocks around, and it’s also the least functional. The fists are made with a 3D printer from plastic but can only hold six knives. You’d only be able to store your steak knife set and would have to find another solution for your chef’s knife/paring knife. On top of that, the knives aren’t that easy to get out. Oh, and did I mention that the knives stick up out into the air? The maker of this holder on Etsy seems pretty cool and straightforward about the piece as more of a conversation starter than a functional knife storage system. Buyer assumes all responsibility for safety once purchased…. seriously, steak knives set backwards in a knife block? Use your best judgement when displaying, using, populating your home with animals or children… or drunk people. All of you looking to get your hands on one of these hands is out of luck for now. The item sold earlier this month. 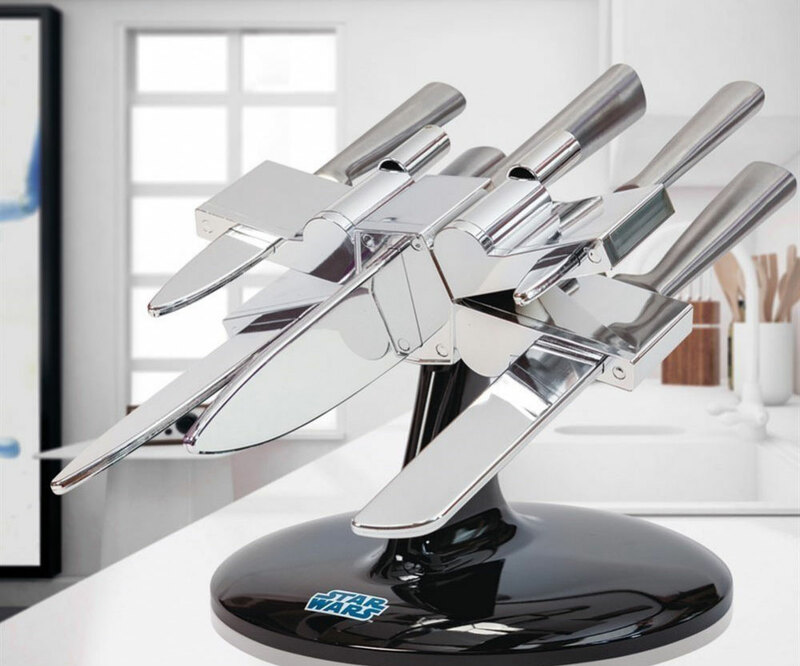 If you thought the Wolverine knife block was insane, the creators of this knife block said, “Hold my Bantha milk.” You may have already seen this knife block before — if you haven’t already bought a few as housewarming gifts — but it’s modeled after the starfighter most commonly recognized from the Battle of Yavin in Star Wars: Episode IV – A New Hope. The X-wing Knife Holder is cleverly designed and holds five “high quality stainless steel knives” (which is actually 3CR14 stainless steel). The lack of good steel and the fact that the holder is coated in chrome probably lets you know the quality of knives you’re getting. No, these knives will not rival those made by Shun Cutlery, but that’s not why you’re buying this set. You’re buying this set because it’s a freaking X-wing! The set is currently going for $134, which is insanely high for what you’re getting. If you’re at all serious about knives, I recommend using that money toward the Victorinox Fibrox 4-Piece Set. Now we transition from Sci-Fi to the macabre. Are you that person who has taxidermied Franken-creatures in their living room or wear all black with black eyeliner? 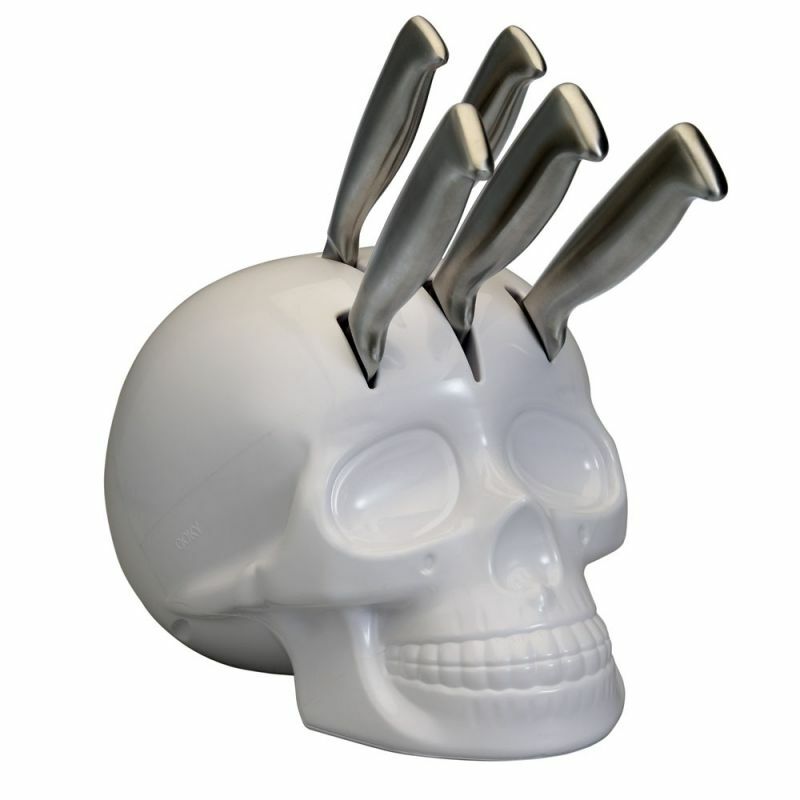 Then this knife block shaped as a skull is for you! 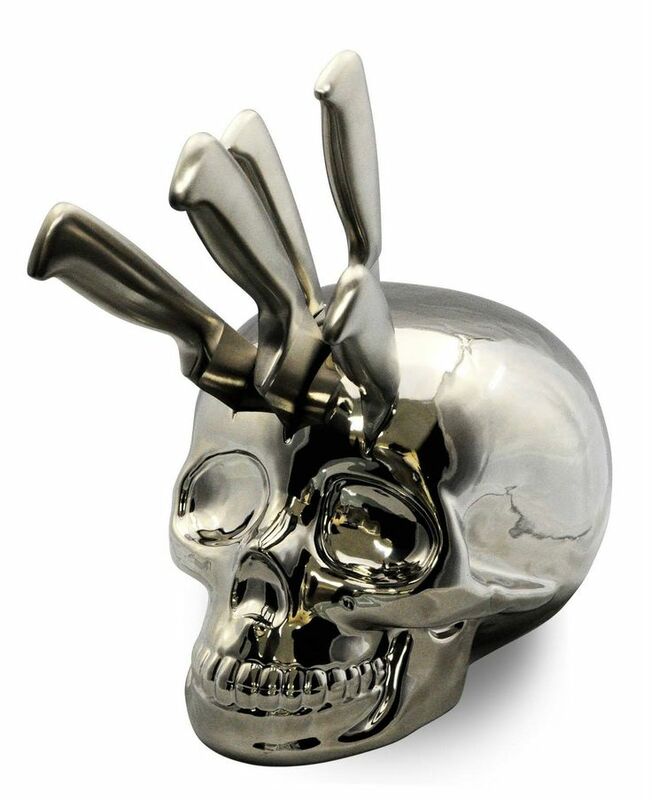 Monica Tsang designed this Skull Knife Stand. Her design intention was “to touch the buyer’s soul but it also combines function and style with each other.” The stand appears to be a one-off creation that wasn’t sold to the masses. That hasn’t stopped others from thinking (or borrowing) the same idea though. 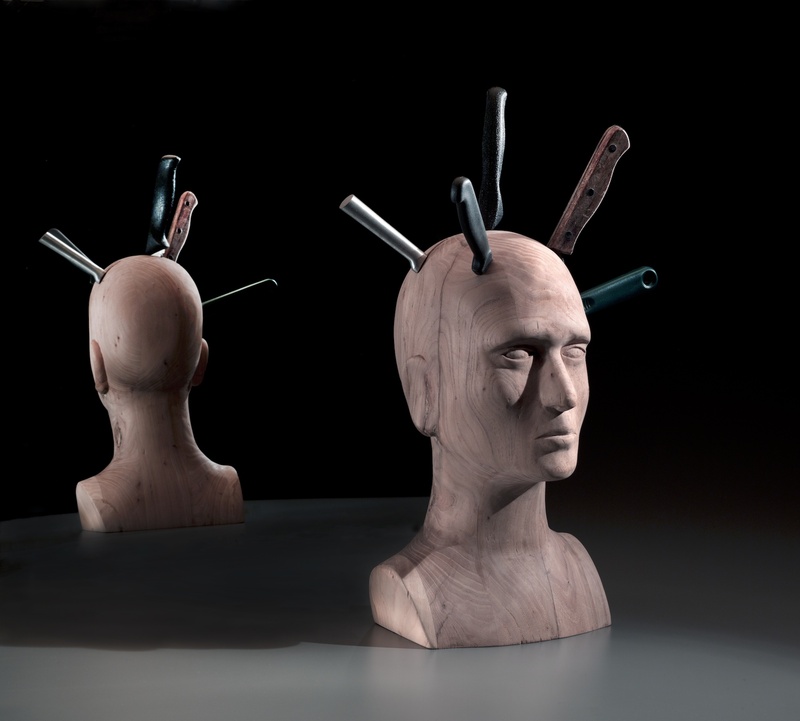 You can find similar concepts around the internet like Skull Knife Block. It’s obviously not as impressive, but it gets the job done. The Spartan army was one of the fiercest military forces in the world about 2,500 years ago. Unfortunately, hubris, ongoing wars killing too many people, and low birth rates cropped the Spartan population during the Peloponnesian Wars. 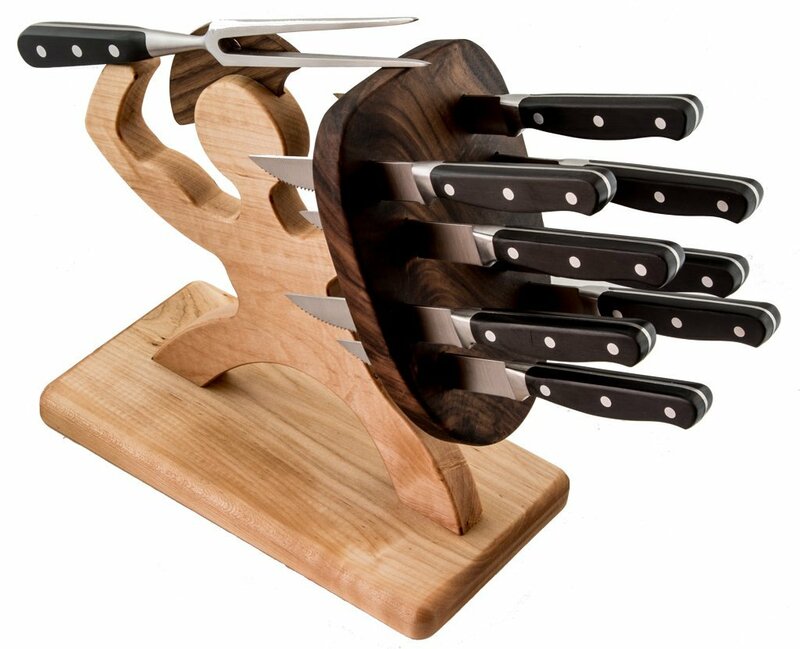 But with the Spartan Knife Holder, you can bring back the glory of the Spartans to your kitchen countertop! The design is actually pretty clever and thoughtful. A Spartan soldier is at the center of the holder as he holds a shield that appears to be riddled with spears. It’s made to hold six knives along with a honing steel that doubles as a spear held by the Spartan. There are a few editions of this, but none of them come with their own knives. You can also get the 10-piece steak knife edition. This Deadpool Knife Block made the rounds a few years ago after someone posted a step-by-step tutorial of how to build it over at Instructables. Deadpool is well-known for his superior healing abilities and even suffered extreme damage to his brain a number of times without much effect. Just look at the film in which he takes a knife to his brain. 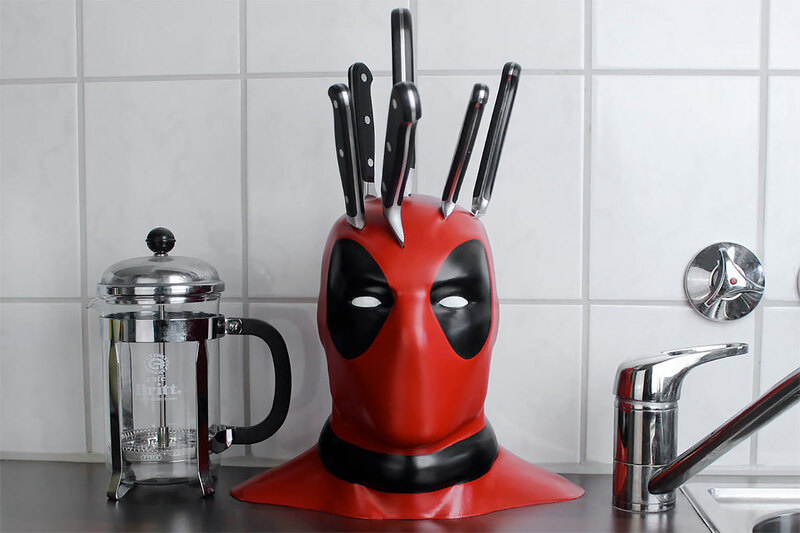 This knife block takes the Deadpool brain stabbing to the next level. Unfortunately for those who aren’t handy or don’t have 3D printers, this is a DIY project that you can’t just go out and buy. But we’ll always have the cool images. 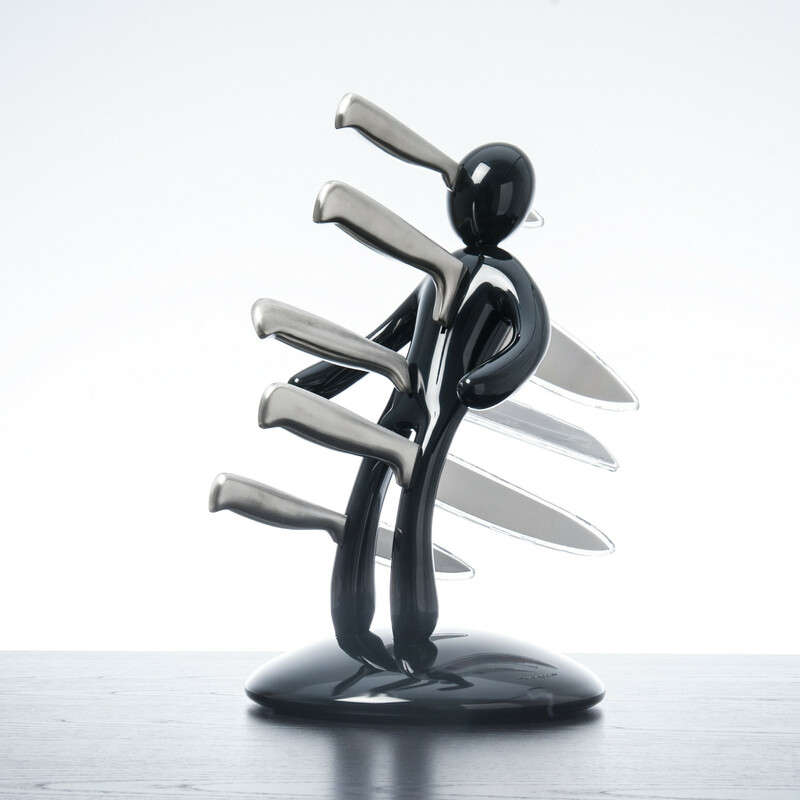 This knife holder is called “The Ex.” Get it? It’s a bit more violent and vivid than I like out of my knives. Any knife enthusiast can tell you the kinds of impressions and bias knives (and those who carry them) battle in the world. Whenever I take my knife out, someone always says, “Whoa, are you going to stab someone?” It’s often a joke, but it still gets my goat every time. Still, the knife holder is a pretty clever idea that’s beautifully executed. 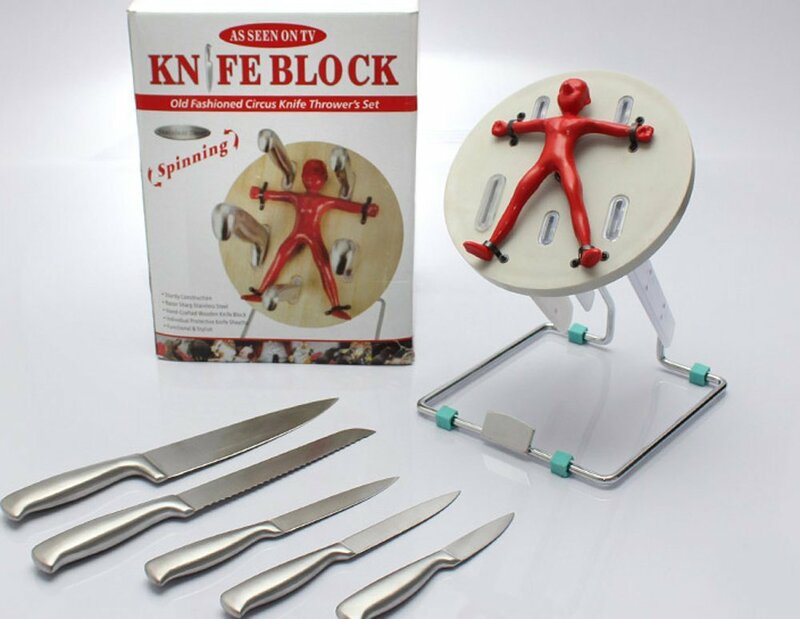 I can’t imagine this costs more than a few bucks to make (excluding the knives), but it’s a popular item that goes for $150 or above. It always pains me to see someone pick up a novelty knife item like this over quality knives and a simple magnetic strip. Here is another one of those concepts that’s simple but well-done. It’s clever, fun, and not nearly as violent as the previous concept. 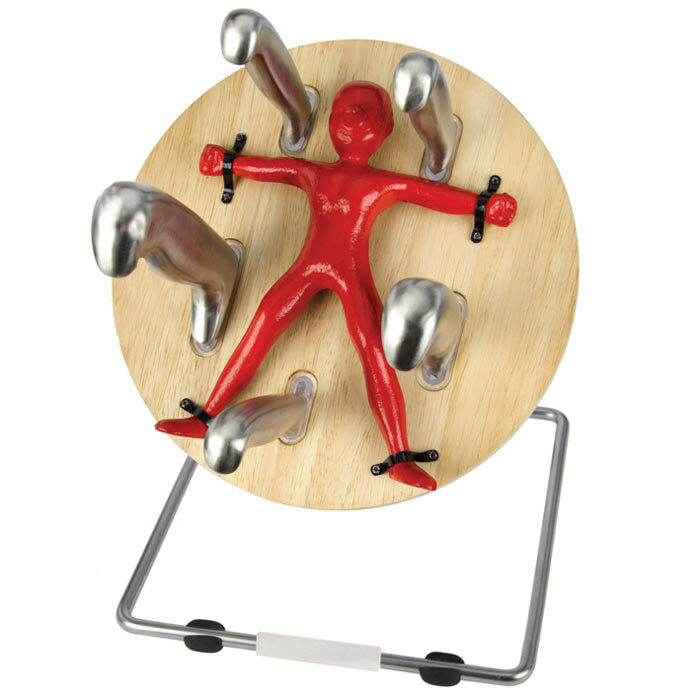 It features a figure tied to a spinning circle with holes to stick your knives. Sheaths prevent the blades from being exposed behind the board, making it safer. The only downside is that it will be hard to not throw knives at this board. Finally we have yet another head block. 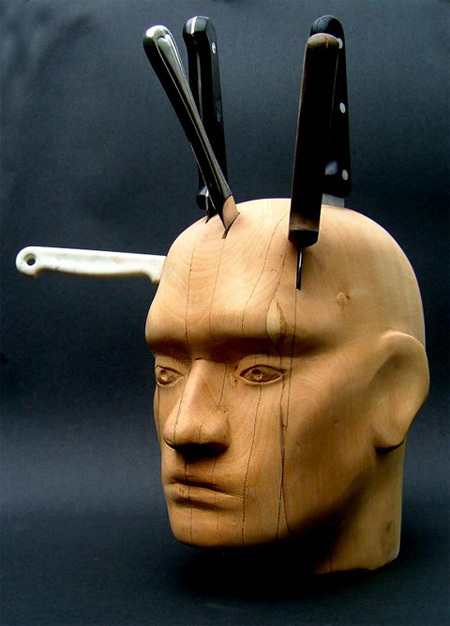 This one is more curious and alarming than the previous knife holder heads, however. Unlike the skull, which is intentionally macabre, or the Deadpool one, which is clever and based on popular culture, this just looks like the head of a mannequin made from wood. This block was designed by Maarten Baas and doesn’t appear to be anything more than a one-off creation, but it often pops up in images around the internet. One thing I like about this block is that you don’t necessarily have to get a set that only fits in this one. It looks like you can just stick a bunch of knives of different sizes and brands inside the head. Here is another block attributed to Baas, though I haven’t found much else about it. Just beware that it will give your kids (and possibly wife) nightmares. How do i go about purchasing a skull knife set(NOT THE WHITE ONE) and what would the cost be. Hello, I actually make and sell those deadpool knife blocks. You can get one here.